It was just two and a half weeks ago that I rescued a cat named Cookie, and now I have a completely different cat with the same name to rescue. 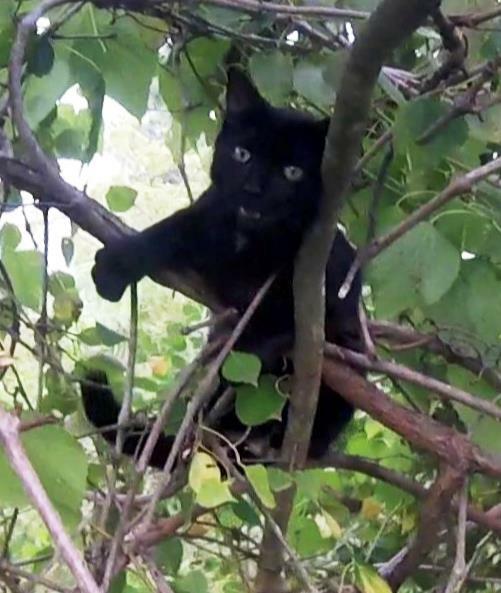 This Cookie is all black except for a thin strip of white on his chest, and he is stuck in the top of a vine-covered Tallow tree on the fence line of his backyard. We don't know why he climbed up there. 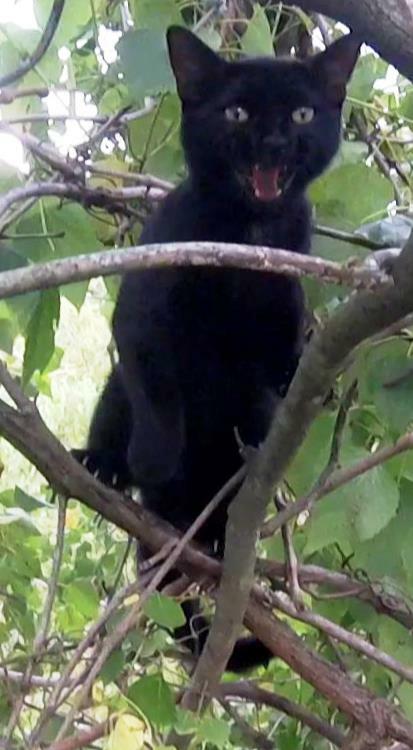 He has never done anything like this before, but there he is now, about 40 feet high on the highest branch of the tree. Sheila found him there late in the evening, and the next day, she called the Animal Control office which referred her to me. You can't see Cookie in this picture, because he is covered by the vines and foliage behind the branch that enters the circle, but that is where he is. Since Cookie was already at the top of the tree, I could not set my rope above him. At first, I picked the next significant branch below him and planned to install my rope there, but just before I began to aim my big sling shot to launch my weighted bag over that limb, Cookie decided to move out just above that limb. It would have been risky to shoot the bag with him so close to my target, and I didn't want to risk hitting him. So I took advantage of this opportunity to set my rope at the top of the tree where Cookie had just been. I shot my line in exactly the right spot without fear of hitting him and installed my rope there. The tree was full of vines, some of it poison ivy. It made for an unpleasant climb up to Cookie as I had to push through the tangles of vines that would frequently get caught on my gear. But I was pleased to see that Cookie was happy to see me when I reached him. 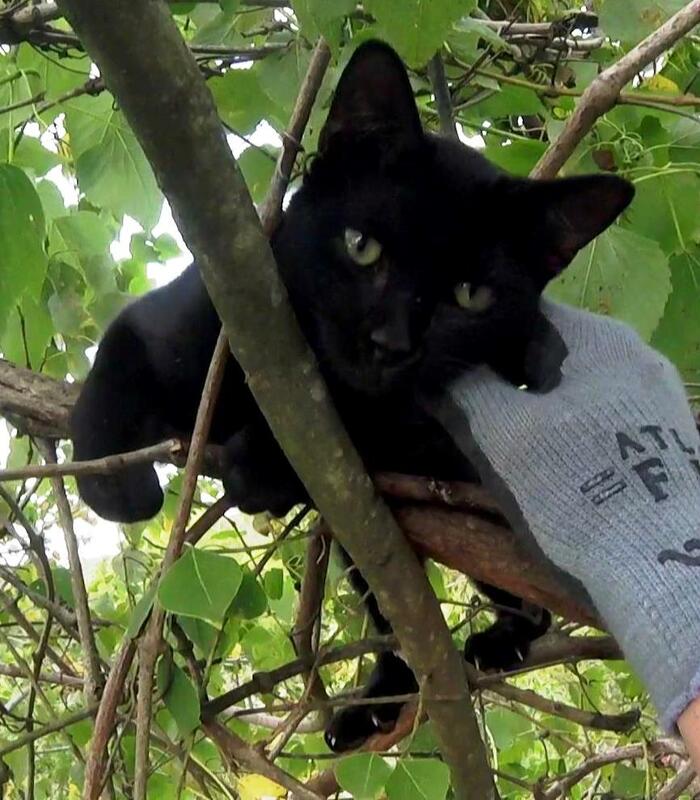 I had to break some vines out of the way between us so I could reach out to him, but he is a friendly boy and let me touch him and pet him right away. 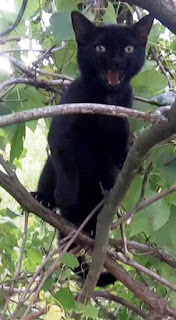 Now that I was close, I could see that he was standing, not on a tree limb, but on tangled vines. I always like to bring a cat down in the carrier when possible, but I have been having a high failure rate with that method lately. Still, I wanted to try it again, so I opened the carrier and placed in front of him as best as I could. I thought he would be a great candidate for a carrier rescue, but he, too, balked at walking inside. I made a note to myself to be sure I clean the carrier thoroughly when I get home in case there is some scent on it that is repelling the cats. The only option now was to bag him, so I prepared the cat bag. I broke some more vines out of the way to be sure they did not get in the way, and then I petted him some more. I massaged his scruff then slowly grabbed him and pulled him out of the vines. I pulled the bag over him, and he was not happy about this at all. In his mind, he had trusted me, and I had betrayed him. He fussed about it but did not struggle, and I secured him in the bag. I brought him down where he was happily welcomed by Sheila and her daughter. Before I had a chance to tell them to take him inside, they took him out of the bag right away. Cookie was relaxed and content in their arms as they took turns holding him and reuniting with him. Sheila thanked me and hugged me forcefully and planted a big kiss on my cheek. They were both very happy to have their kitty down, and that is what I most like to see after a rescue. The kitty is down and safe, and the family is happy. I can go home now.